I don’t recollect seeing very often early images clearly showing a woman as pregnant. The photo , courtesy of Nancy Benton, would have likely been taken in Barton County, Missouri. David was born in Putnam County, Indiana. He married Delana Fowler in Neosho, Kansas in 1869. They moved to Liberal, MO, in 1872 where they were active in the Methodist Church. His daughter, Bettie, is supposed to have been the first child baptized in the church. In 1895 they moved to Dade Co., MO. In 1902 he purchased an acreage south of Greenfield, MO, which he sold to his son Alva in 1906. In June, 1906 he purchased Lots 18, 19 and 20 in Block 1 in Pilgrim. His will divided his land between his children Mary Catherine Spurling, Jessie Jones, Walter Brewer, Elizabeth Jane Noyes, Lewis Brewer, John David Brewer, and Daniel Brewer. His son Walter was administrator and turned in a sale bill totaling $341.33. Delana was born in Bloomington, ILL. At the age of 9 she moved with her parents to Osage Mission, Kansas, where she met and married David in 1869. After David died, she lived with her children. I remember her as a very tiny old lady. David BREWER was born to Daniel Levi BREWER (of Mercer Co. KY) and Catherine HEDDEN (also of KY) on Oct 31 1850 in Putnam Co. IN . He died the 29th of August 1921 in Greenfield, Dade Co. MO. David was the 5th of apparently 9 children, and the 4th son. Daniel was about 27 and Catherine about 28 when he was born. When he was young, the family moved to Bloomington, Mclean Co. IL, where David’s future wife, Delana FOWLER, was born, 12 Sept. 1854, to John B. FOWLER and Mary Jane JOHNSON . Shortly after the Civil War, the families moved to Osage Mission (St. Paul) Kansas, where David’s father, Daniel Levi Brewer, died 1868 April 20. 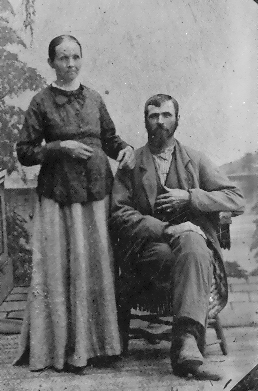 Delana FOWLER and David BREWER were married in Neosho, Kansas, 1 March 1869. John David Brewer b. 1869 Dec 10 at the Osage Mission, Neosho, Kansas, died 1943 Feb 26 in Joplin, Jasper, Missouri, married in 1889 to Eva Hall, b. 1879 Aug in Missouri. They had 12 children. Mary Catherine Brewer b. 1872 Jan 10 in St. Paul, Kansas, died 1957 December 12 at Liberal, Missouri and was buried in the Englevale Cemetery in Englevale, Kansas. She married 1st George Spurling, then before 1939 a Rhodes (unknown), then Robert Lincoln Trent who was born 1878 April 5 in Galesburg, Kansas and died 1958 Feb 10 in Liberal, Missouri. (Thanks to Barbara Krogh for this information on Mary Catherine and Robert Trent. Her information is drawn from their death certificates and had differed from mine and so I’ve updated the information here. She also has Robert buried at Forest Chapel Cemetery as opposed to Carr’s Chapel Cemetery, which was the information I’d had.) Carr’s Chapel Cemetery in Greenfield, Dade, Missouri. His sister Rose married Daniel Brewer. Daniel Brewer b. 1874 Jan 13 in Barton County, Missouri, died 1939 Jan 1 at Greenfield, Dade, Missouri, was buried at Carr’s Chapel Cemetery in Greenfield, Dade, Missouri. He married Rose E. Trent b. 1878 in Kansas, died 1948 and was buried at Carr’s Chapel Cemetery at Greenfield, Dade, Missouri. James William Brewer was born 1876 Jan 5 and died 1876 Aug 25. Elizabeth Jane “Bettie” Brewer was born 1877 July 22 in Barton County, Missouri. She died 1963 July 9 and was buried at the Liberal Cemetery in Liberal, Missouri. She married Ray Noyes. This family is written of elsewhere in this blog. Lewis Brewer was born 1880 May 19 in Barton County, Missouri and died 1932 May 19 in Greenfield, Dade, Missouri. 1902 July 4 at Everton, Dade, Missouri he married Pearl Eva Jones b. 1885 May 5 at Everton, Dade, Missouri, died 1966 May 10. Lois Brewer was born 1880 May 19 at Barton County, Missouri and died 1881 January at Barton County, Missouri. Elmer Brewer was born 1883 Dec 25 and died 1919 May 1 at Greenfield Dade, Missouri. He is buried at Carr’s Chapel Cemetery, Greenfield, Dade, Missouri. He married Rosa Bell Jones, born 1885 July 25, died 1939 May 13. She was the daughter of Jim Jones and Lucy Coble. Alva Brewer was born 1885 Aug 10 at Barton County, Missouri and died 1909 May 24. He was buried at Carr’s Chapel Cemetery in Greenfield, Dade, Missouri. Robert Walter Brewer was born 1890 Nov 15 and died 1969 in Joplin, Jasper, Missouri. He is buried at Carr’s Chapel Cemetery, Greenfield, Dade, Missouri. He married Edith S. Gilmore who was born about 1894 in Missouri. Alva’s death was an accidental drowning in a swollen creek. These are a couple of letters from Rachel Jane Henderson to her niece, Mrs. Elmer (Mary Elizabeth Brewer) Porcupile, after the tragic death of her son, Nova Windom Henderson who died May 2, 1909 and a letter about the death of one of her brother Dave Brewer’s son’s (Alva). From “Six Generations of Brewers” by; Norma L. Roberts, 1976. Transcribed January 13, 2001 by Ed Henderson. Alva died on May 24 1909. Following is the letter concerning his death. 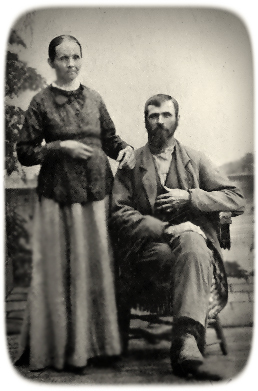 Jessie and her husband, Levy JONES, are given as having resided in Yakima, Washington. Photos exist of Bettie Brewer NOYES visiting her sister, Jessie, there in Washington in later years. It would appear that Jessie and Levy didn’t move to Washington until after 1930 as they are still in the Dade Co., Missouri census in 1930. She was known to be living in Selah, Yakima Co., Washington at the time of her mother’s death, as evidenced in her mother’s obituary. She is not mentioned in the obituary of Bettie Brewer NOYES and so had perhaps deceased by then. Jessie’s sibling, Lewis, married Pearl JONES. Walter and his family lived near Oscaloosa, Missouri, when I was growing up. They moved to Joplin sometime during the 1940’s. Walter was a some-time preacher. I have yet to locate the family in the 1870 census. The 1880 census shows the family in Central, Barton, Missouri. Year: 1880; Census Place: Central, Barton, Missouri; Roll: T9_673; Family History Film: 1254673; Page: 389B; Enumeration District: 258; Image: 0115. Delana’s father died 1883 in Greenfield. I have yet to locate the family in the 1900 census. In 1902, David purchased acreage south of Greenfield, Missouri, which he sold to his son, Alva, in 1906. Nancy Benton furnishes the paper which I’ll post in another blog. Dela’s mother died 1902 in Greenfield. David’s mother died in 1903 in Greenfield. Nancy Benton writes that in 1906, David purchased, at Pilgrim, Dade, Missouri, Lots 18, 19 and 20 in Block 1. I’ve a letter dated 1907 July 25 that David wrote to Jim Brewer, that was sent in care of Rachel Jane Henderson, their sister, who was living in Chautauqua County. I’ll post this in another blog. Their place in the 1910 census is yet to be found. In 1920 they were in Polk, Dade, Missouri. The 1930 census finds Delana in North, Dade, Missouri living with son, Daniel. Year: 1930; Census Place: North, Dade, Missouri; Roll: T626_1185; Page: 3A; Enumeration District: 9; Image: 0134. I will publish in other blogs additional photos, obituaries and a newspaper article on Delana. Jessie Brewer Jones b. Jan 10, 1888 d. Jun 22, 1981 in Yakima City, Wa. Levy Jones (note correct spelling of first name) b. Dec 28, 1883 d. Dec 28, 1952 in Yakima City. Both are buried at Tahoma Cemetery in Yakima. I’ve traced the 3 boys, but have no information on the daughter Mary. Herbert Leo Jones b. Oct 28, 1910 d. Mar 7, 1989 Yakimia and married in aug 27, 1947 at Selah to Edna Lambeth b. Mar 1, 1919 d. Oct 10, 2006. They had no children of their own. She is buried at West Hills Memorial Park in Yakima. Herman C. Jones was my wife Dieanna L. Jones Swearngin’s grandfather. His wife was Opal Marie Simmons. I had the pleasure to meet my wife’s Gr, grandmother Jessie Brewer Jones and we have a 5 generation pic of our son James, Dieanna, Junior Jones her father, Herman Jones and Gr Grandmother Jessie Brewer Jones taken in Selah, WA. Dieanna was not aware of all the family until recently. She has info on Mary Katheryn Jones Smith also formerly of Selah. There was also another son: Troy Noble Jones who died as a infant. We welcome any & all replies from her unknown family. Thank you, Barbara. I’ve added your information to the post. I apologize for butting into the conversation; however, I believe that Mary Elizabeth was my great-grandmother. I have recently begun attempting to put together a family history and discovered that Mary Elizabeth Brewer Porcupile was the mother to my grandmother Mary Mildred Neva Ninion Pearl Ellen Porcupile. My mother is Sandra Joy Watson Southard. I would love to connect for further information if that would be acceptable. You may con act me at my email. Thank you.